This is a great, simple recipe for a pumpkin pie filling and better yet it’s also dairy-free! (All SCD recipes on this blog are dairy-free, but I make a point of this aspect particularly as a number of pumpkin pie recipes call for dairy, usually cream. I use coconut milk instead.) Before I started blogging, I also submitted it to scdrecipe.com a long time ago and can be seen here. (The site has printer-friendly versions for all the recipes, a bonus.) The only thing that copy lacks is the pictures, but it’s the same recipe. 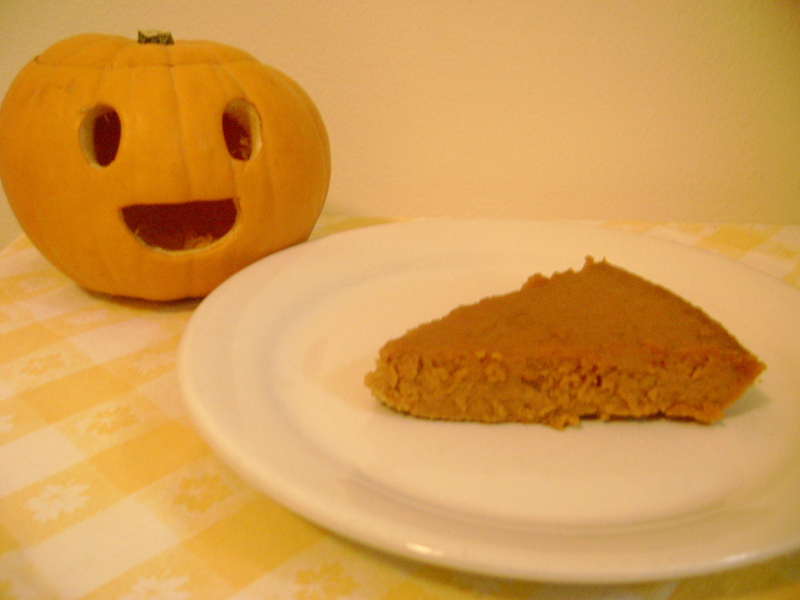 The pumpkin pie pictured above was baked in a store-bought rice flour pie crust (same with the minis, pictured below), however I’ve baked it many times without a crust and it’s just as good. I usually don’t make a pie crust for this one since I haven’t made a crust with almond flour that’s been satisfactory; in my case I’ve found that almond flour crusts are heavy and the nutty flavour can overwhelm or distract from the filling’s flavour (not just pumpkin). The last time I made an almond flour pie crust was for the Apple Galette from Jenny Lass and Jodi Bager’s Grain-Free Gourmet. Everyone ate it and enjoyed it, but agreed about the crust: it was too heavy. When I made the pumpkin pie with a store-bought rice flour pie crust, I had some leftover pumpkin filling so I used the rest to make mini tarts, using some store-bought rice flour tart shells I had on hand. The pie crust was an 8-inch, usually I use a 9-inch pie pan. I’ve included instructions and baking time for these, following the regular instructions. As I didn’t make my own tart shells, I trust that you’ll have your own recipe for SCD- or GFCF-friendly tart shells until I make my own recipe. Preheat oven to 425ºF. In a bowl, whisk the egg yolks, eggs, and pumpkin puree. Add the spices, and once they’re fully combined, pour in the honey and mix again. The batter will become very wet and it will be liquid, but keep on going. Add the coconut milk, and stir well to combine. Pour into a baking pan: either a pie dish or a rectangular deep dish and bake for 15 minutes. Reduce oven temperature to 350ºF. and continue baking for another 30-35 minutes. 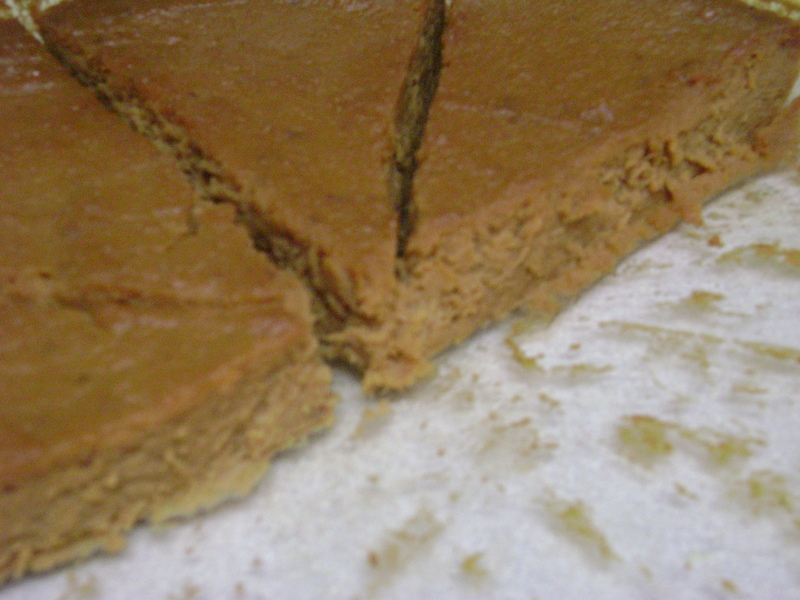 Remove pumpkin pie from the oven and slice into squares (if using rectangular dish) or into regular pie slices. It will have two layers: the top layer will be a dark orange and the bottom layer will be a soft, pale orange. Note: if you use a crust, you may have to bake it a little longer to ensure the crust is baked through, which depends on the crust and filling. 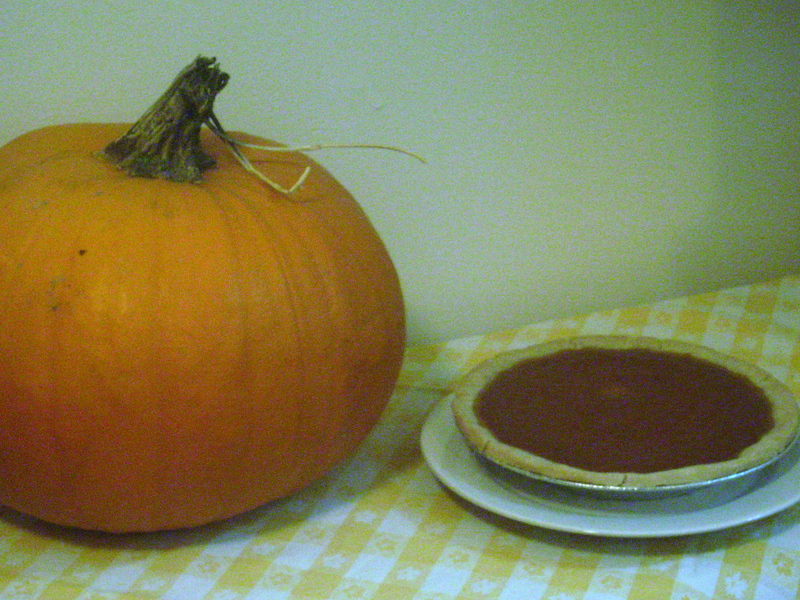 I baked my pumpkin pie with crust for an extra 13 minutes. As aforementioned, I used what was left of the pumpkin pie filling and it was enough for 4 mini tarts (pictured above). Preheat oven to 350ºF. Fill the mini tart shells with pumpkin filling and bake 15-25 minutes (check after 15 minutes to see if the extra 10 is required or not, depending on the crust). Once the filling is set and the crust firm, remove from oven and cool before serving. Enjoy! Coconut cream is the thick, non-liquid part that separates and rises to the top of coconut milk when settled. If you use canned coconut milk (making sure that it’s free of additives and preservatives, with the exception of citric acid; a recipe for making your own coconut milk can be found here from JK Gourmet), do not shake the tin! You can make this straight out of the tin, or you could also refrigerate the unopened can overnight, or longer, as it will help separate the cream from the liquid; what will be leftover is water, which can be drunk or used in another recipe. I make this whipped coconut cream as needed and it’s sweetened to taste. Adding a hint of vanilla extract can help round out the flavours, if desired. (Use the real, natural stuff. Alcohol or glycerin is fine.) If you choose to heat the honey so that it’s runny, make sure it’s lukewarm before adding to the coconut cream, otherwise the cream will melt. You may also use creamed honey (if you don’t have store-bought, you can easily cream your own honey by simply mixing it in a bowl with a fork and beating until it’s thick and is a spreadable, creamy consistency). In a tall container, beat the coconut cream using a hand-held blender or frother until peaks start forming. Add honey or maple syrup to taste, continuing to whip after each addition. Add the vanilla last, if desired. Refrigerate to help thickening. Enjoy! Whipped coconut cream doesn’t hold the same as dairy whipped cream, as far as frosting goes, since it isn’t as stiff. Although you could still try. It will also work if it’s homemade; just simply make coconut milk and refrigerate it, the coconut cream will eventually rise to the top. I’ll have to give the whipped coconut cream a post of its own, someday.